More than 20 swans from the Queen's flock have died and several more are "dying at the moment" amid fears they have been infected by bird flu. Seven of the dead birds have been sent for testing to establish whether avian flu is responsible. Defra confirmed it is investigating a suspected finding of avian influenza in wild mute swans in Berkshire. David Barber, the Queen's Swan Marker, said "quite a percentage" of the flock had died. He added: "Bird flu has been going round the country... and unfortunately it's hit Windsor." Mr Barber, who is responsible for the centuries old tradition of carrying out the annual swan census, said staff were monitoring the situation and trying to stop the spread. Image caption A sign of the illness is if swan's necks are not entirely straight, and some of it is bent backwards. 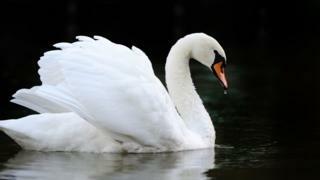 He added: "There are many swans that have died in the flock at Windsor which is extremely disappointing. "I know there is well over 20 that have gone, and probably 20 still dying at the moment. It's quite a percentage." This outbreak comes days after a bird flu prevention zone was established across England to "help prevent the virus spreading"
Thirteen wild birds were found dead in Warwickshire and they were confirmed to have the disease. It follows the discovery of the strain in wild birds in Dorset, where a total of 31 infected birds were identified. The Food Standards Agency said bird flu does not pose a food safety risk for UK consumers.